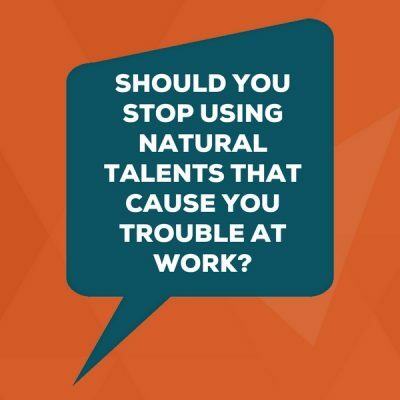 In this episode Lisa answers the question, “Should you stop using natural talents that cause you trouble at work?” The short answer is no. The talent, or combination of talents, that’s causing you trouble is your natural talent. It’s much better to work to find other ways to utilize the “trouble maker” talent. Lisa provides two different exercises for you: one for you as an individual, and one for your team. If your team hasn’t completed the Clifton StrengthsFinder assessment, the list of personal branding adjectives on our website will be useful for the exercises in this episode. “You know, I don’t like my Includer. When I saw that on the list, I wanted to give it back because it makes me too slow. It makes me miss deadlines because I’m always getting everyone’s opinion. I put the word out. I ask the question. I go one on one. People ask me for more time, and by the time I get everyone’s input on something, I’m already behind schedule. Blind Spots – often your natural way of thinking or doing that creates issues, yet you’re not aware. Basement – for people who geek out on StrengthsFinder deeply, you might hear “Balcony” and “Basement” referring to the beautiful side of a talent and the darker, not as great side of a talent. Shadow Side – this is the concept that even great traits, when overused or misapplied, can have a downside. Raw Versus Mature – this shows the contrast between a natural talent that is un-invested in or unrefined (raw) and one that is operating at high performance (mature). On the surface, all of those things I just mentioned…yes, they are real troubles. The thing is though, you shouldn’t squash them down. You can’t stamp it out and say, “Oh, that one’s not serving me. I don’t want it anymore.” Remember, your natural talents are patterns in you. They’re how you think, feel, behave at your natural default so they’re gonna come out. It’s like the jack in the box. Do you remember that toy that you might have had when you were a little kid? You push this toy down into the box, close the lid, and you start turning the crank and you hear that “Du, De, Du, Du, Du, Du, Du, Du. Du, De, Du, Du, Du, Du. 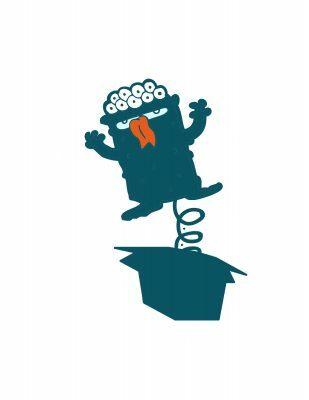 Du to BAM!” That thing jumps out and scares you when you least expect it. Your talents are really just like that. If you squash them down because you think, “ah, my boss doesn’t seem to like that one. Ooh, I got bad feedback on that one once, so I don’t want that one. I’ll just put that one away.” Or you stamp it down, because you don’t perceive that the culture you work in is appreciative of that talent, so you decide, “I’ll just use this one at home. I’ll use that one at work.” These are all things I hear in training constantly, but the thing is, it’s kinda like the jack in the box. If you try to squash out those talents, they are going to jump out and scare people, because they’re your natural default ways of thinking and feeling and acting, so they’re going to come out. Since they’re going to come out, what you want to do is spend more time refining it, nurturing it, putting it to work, send it to the gym, get others-aware. Think about how that talent shows up as you interact with other people. Invest in yourself in a targeted way. For example, take that person who mentioned the Communication talent. Imagine how helpful it would be if she knows which peers are willing to talk out issues aloud. She thinks by talking things out. If she knows an audience of people who love to talk it out with her, they all get what they need. And she also needs to be aware of those peers who perceive it like a waste of time because they don’t like ideas that aren’t well thought out. So part of the solution is knowing your audience. Another thing she could do is really think about different modes where she could practice her Communications talent: email, spoken word, written word. Maybe she’s getting this feedback because she was taking over in meetings, and not letting anyone else have a voice. So we’re taking one situation (meetings) and one mode of communication (the spoken word) and she just decided, oh, I don’t want this talent at all. It’s not serving me. Actually, she has all these other ways of applying it and refining it. Take the other example with the guy who has the Includer talent. It was making him slow. It was making him miss deadlines because he was asking people for their opinion, but he wasn’t giving them any time-binding around his question. He would throw something out there in person or in an email and tell them he wanted to hear their voice, but he didn’t give them a deadline. Today, he’s really specific when he asks. Now that he’s refining it and investing in it, he’s still noticing people. He’s still getting the unheard voices to be heard. He’s still making people feel seen and appreciated, but now he gives them deadlines, so he can also meet his commitments. The other thing that he’s been doing is running experiments for in-the-moment Includer. When he’s in a meeting and he notices, everyone has spoken up except two people, now he can say, “you know, John, we haven’t heard from you, what do you think?” He gave himself some script items: “We haven’t heard from you. What do you think? It’s a great way to be able to feed the talent without discarding it altogether. Don’t squash them. Refine them. What’s your troublemaker talent? Or, if you have more than one, what is your combination of talents that team up to create trouble, like I mentioned with my Maximizer and Strategic? What experiments can you run to use those talents in new ways? Remember, it’s not an either/or. It’s not that your strengths, or your talents, need to be turned on or off. Keep giving them new environments to play in. The more you nurture them and experiment with them, and aim them to specific performance, the more refined they’re going to be. Give everyone around the table a blank sheet of paper and then write down their troublemaker talent on that piece of paper at the top, like a title. If you’ve done StrengthsFinder, that would be one of your StrengthsFinder talent themes. If you haven’t done StrengthsFinder, use LeadThroughStrengths.com/adjectives. That page gives you a bunch of words that might describe each person. Have them select the 5-10 words they identify with most. You can have people go through this additional exercise before you come to the meeting. Usually, each of those words, even though there are positively framed…are going to have the great side of them…and they also bring a shadow side with them if they are overused or misapplied. It will take a little extra work if you haven’t done StrengthsFinder, but you can get there by reframing their words from that adjective list into their potential trouble maker talents. Back to the sheet of paper, where you have your talent(s) written at the top. For example, it might say Responsibility is the troublemaker talent for this person on your team. Then, they write one sentence about the trouble it’s causing them. What is the pain it’s creating? For example, if you had the Responsibility talent, it might say, “I can’t say no.” If you’re leading this exercise, be sure you’ve thought of your own in advance so that you can model for them what yours sounds like. You can use the example I just used, and then you give your own as well, and then they’ll see how to make a nice crisp problem statement. This is a creative thinking exercise. The next person might give a different tip, yet it still honors the Responsibility talent. So they might say something like, “next time you feel like you want to say no, but you can’t find the words. Tell them, ‘Ooh, that project sounds really valuable. Let me look at my calendar and review all of my commitments and I’ll get back to you by tomorrow.’” Essentially they’re offering a stalling tactic, so that they can get their head together and find the right words and the right approach instead of just saying yes in the moment. The idea is to give the person ideas that can solve this challenge while still honoring the talent. So that’s the exercise. I like passing it to the right three times because you get three different layers of answers and then you send it back to the original person, and it just gives them a way of thinking about the world that isn’t in their typical mind-frame. It’s a nice way to help them brainstorm some potential solutions and see how other people view the same situation at work. To think of variations of this exercise, check out Marshall Goldsmith’s exercise called FeedForward. Get it? Like Feedforward rather than Feedback that looks to the past? It’s an awesome way of giving and getting feedback from each other. And there’s absolutely zero defensiveness (because that’s built into the exercise). Even though the videos are low res, his content is timeless and worth every moment of your time. He is a goldmine of leadership genius. If everyone on the team knows their StrengthsFinder talent themes, make this even more layered and get people learning all 34 CliftonStrengths talent themes by writing all five of their talent themes in a corner and then do the same thing I already mentioned. This way, when you see the person with Responsibility also has Command, also has Includer, also has Connectedness, also has Individualization. Then, you can give an answer that is, “Ooh, look, this person has Individualization, so in this way the person with Responsibility would probably find it important to give a custom answer to every person who asks for something from them,” so you could give them something like a formula for finding the words we’re saying no, yet also allow it to be customized to the person who’s receiving it. A final thought on troublemaker talents is to remember there’s not an on and off switch. Just because a talent is not serving you today, don’t shut it off, squash it down, or stamp it out. Refine what you have. It’s gonna come out anyway, like a jack in the box. It will jump out and scare people if you choose to not invest in it. So with that, I’ll see you next time and I can’t wait to hear how you’ve claimed that talent invested in it and shared it with the world.